Unfortunately some people still believe it’s acceptable to drop litter in the street or generally just leave rubbish lying around behind them. I recently picked up two empty beer cans which had clearly just been thrown from a passing vehicle! As a result, keeping our village clean and tidy takes a bit of effort, and a couple of weekends ago some hardy souls (or even soles!) were out and about on the village annual clear up! 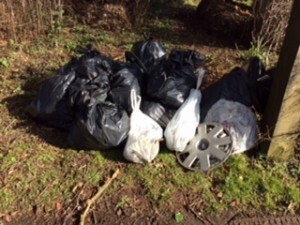 A large number of bin bags were filled (as evidenced below) and the team also used their own and others’ rubbish bins to dispose. A big thanks from all of us to those who assisted in this unfortunately essential task, but everyone can help. If you see any litter, and it’s not overly inconvenient, please pick up and dispose in the nearest bin. Or look out for next year’s March collection and come along and assist. 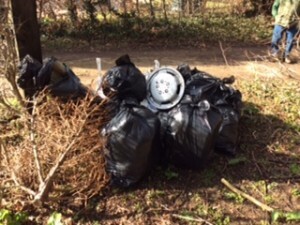 Everyone’s efforts will be hugely appreciated and, most importantly, will keep our village beautiful.